Mom Among Chaos had the opportunity to check out a pre-screening of "When The Game Stands Tall" last week at the Novi Emagine. I was really excited to see this movie. I was expecting something along the lines of The Blind Side, but boy was I wrong. 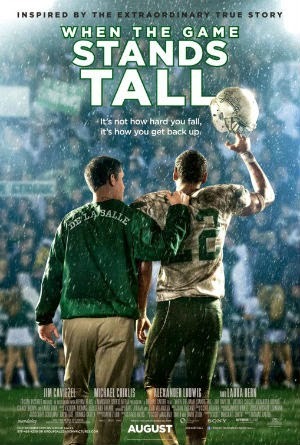 This movie is about a high school football team in California that had a 151 game winning streak over many years. The movie is based off a book by Neil Hayes. You can purchase the book on Amazon. I liked that the movie had a Christian theme. I also loved the main character who is the football coach. He was soft spoken and kind. The movie had a great moral of working together as a team. My husband loved this movie. He thought it was the best movie he had seen in a long time. I even caught him crying during a few emotional scenes. I personally thought the movie should have been shorter. I kept waiting for it to end, which is a bad sign. If you are a football fan, I would highly recommend checking this one out. I personally would give this movie 3 out of 5 stars. I did not fall in love with it, even though my husband did. So, if you're looking for a good christian based movie or just love football, go see it. It's playing now. You can learn more about the movie by liking "When The Game Stands Tall" on Facebook.